DICE has warned that Battlefield 3 players who play on unofficial servers could end up having their Origin accounts banned and losing all the games attached to it as a result. 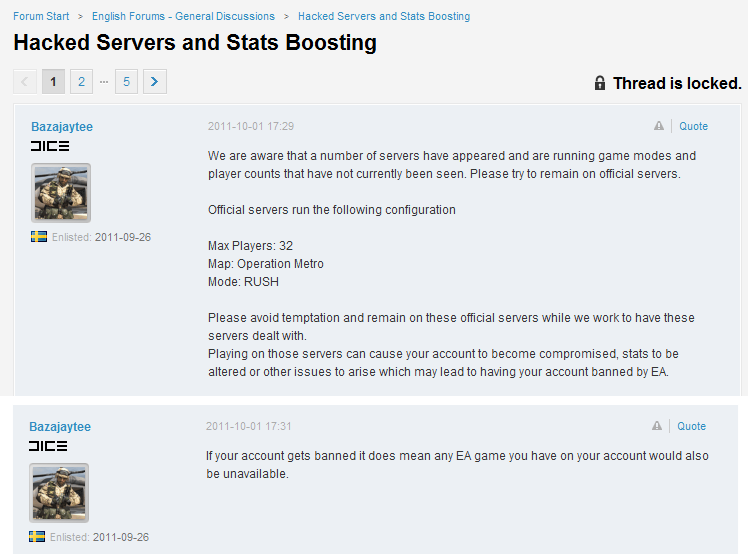 If you're playing the Battlefield 3 beta, you might want to take care with which servers you click on. The server files leaked out last week - quelle surprise - and that's allowed gamers to set up servers in whatever configuration they like. One such setup ratchets the maximum number of players in the Operation Metro map from 32 to more than 100. Sounds like fun, but beware! 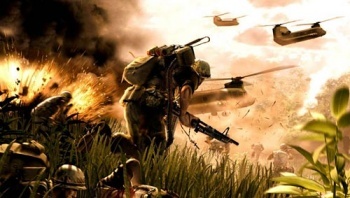 According to Battlelog user Bazajaytee, who is apparently an associate producer at DICE, those who stray onto unofficial servers could face serious repercussions, including the loss of all games attached to their Origin account. "We are aware that a number of servers have appeared and are running game modes and player counts that have not currently been seen," he wrote, explaining that official servers run only the Operation Metro Map in Rush mode with 32 players. "Please avoid temptation and remain on these official servers while we work to have these servers dealt with. Playing on those [unofficial] servers can cause your account to become compromised, stats to be altered or other issues to arise which may lead to having your account banned by EA." In a follow-up post, he clarified, "If your account gets banned it does mean any EA game on your account would also be unavailable." Harsh, eh? Origin isn't the only digital service that can take your toys away for breaking the rules - I would assume they all can - but it's not the sort of stick that usually gets swung with such enthusiasm. I don't know about you but when I'm browsing servers, I look at ping and population and go where the action is; could I be banned because I didn't pay enough attention to my choice of battlefield? It probably won't ever actually happen, but just threatening to relieve gamers of every EA-registered game they own for what is undeniably a relatively minor infraction of the rules is a terrible way to treat your fans and potential customers.